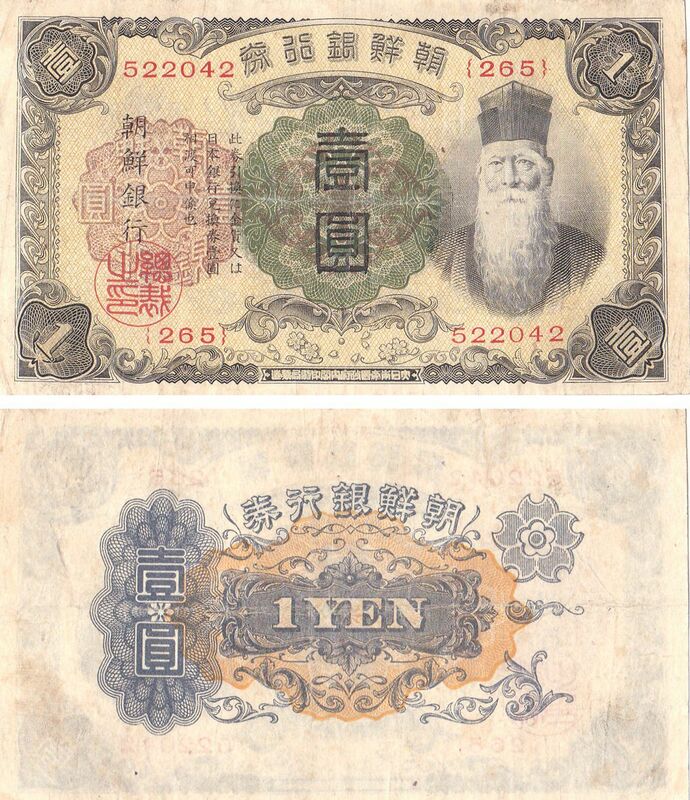 L1010, Bank of Korea (Chosen), 1 Won (Yen), 1932 Issue P-29. VF condition, please refer the picture. Issued in 1932 by Japanese occupied government in Korea. Krause Catalogue: P-29. 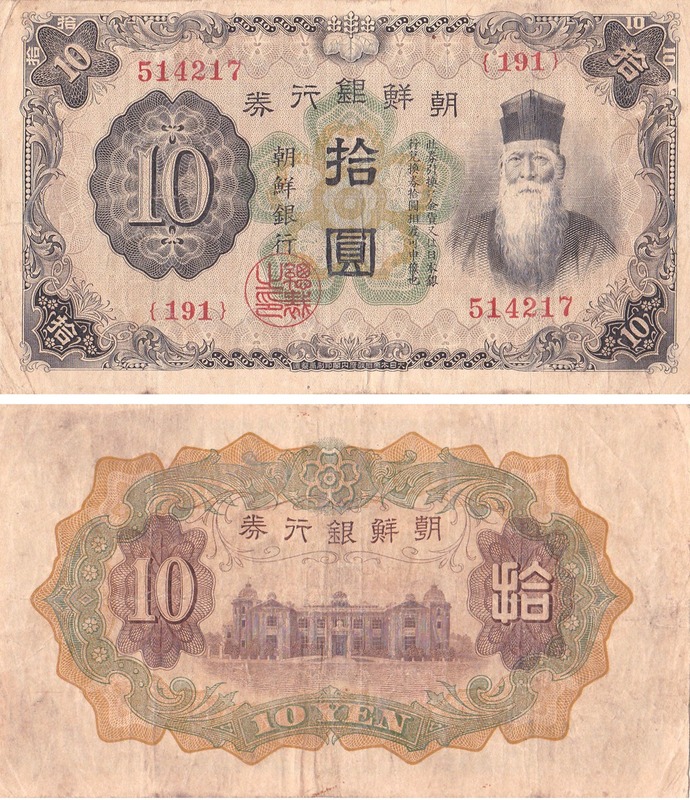 L1015, Bank of Korea (Chosen), 10 Won (Yen), 1932 Issue P-31. VF condition, please refer the picture. 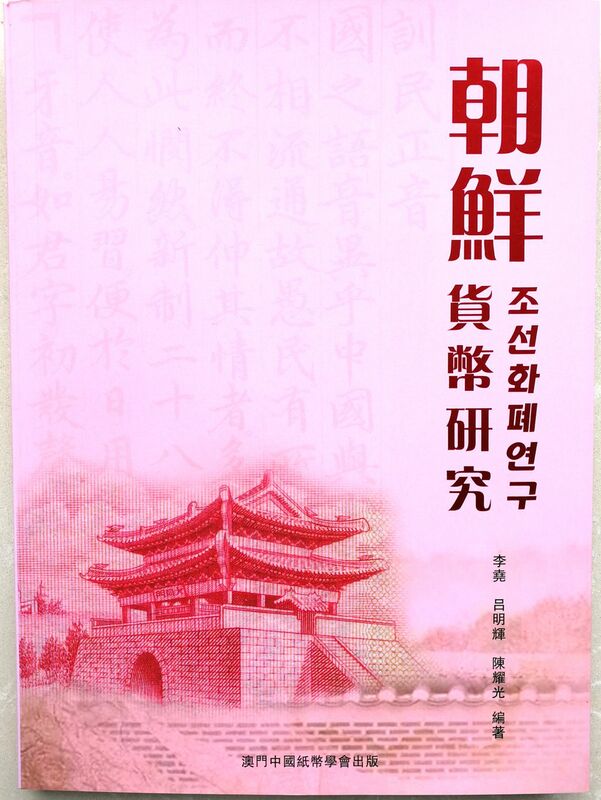 Issued in 1932 by Japanese occupied government in Korea. Krause Catalogue: P-31. 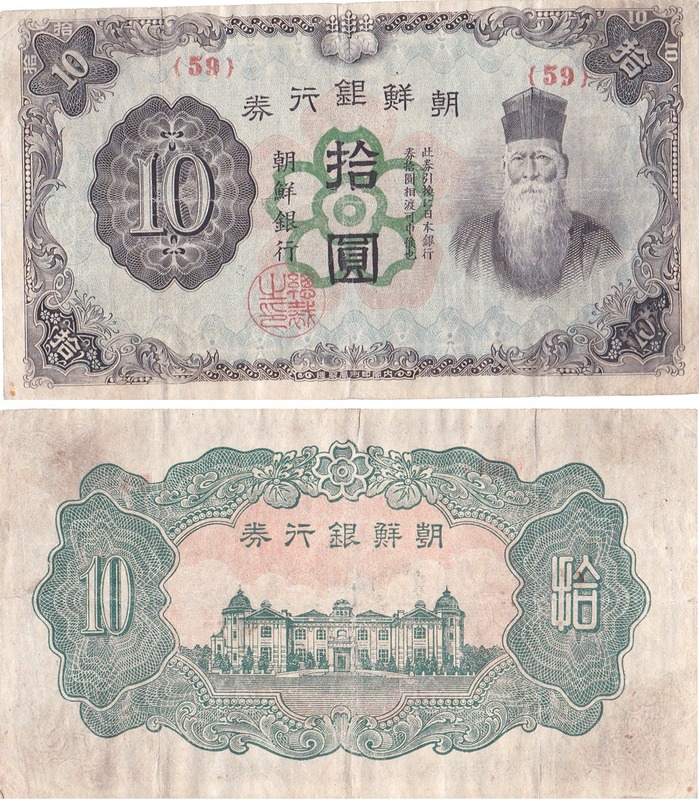 L1020, Bank of Korea (Chosen), 10 Won (Yen), 1944 Issue P-36. VF condition, please refer the picture. Issued in 1944 by Japanese occupied government in Korea. Krause Catalogue: P-36. 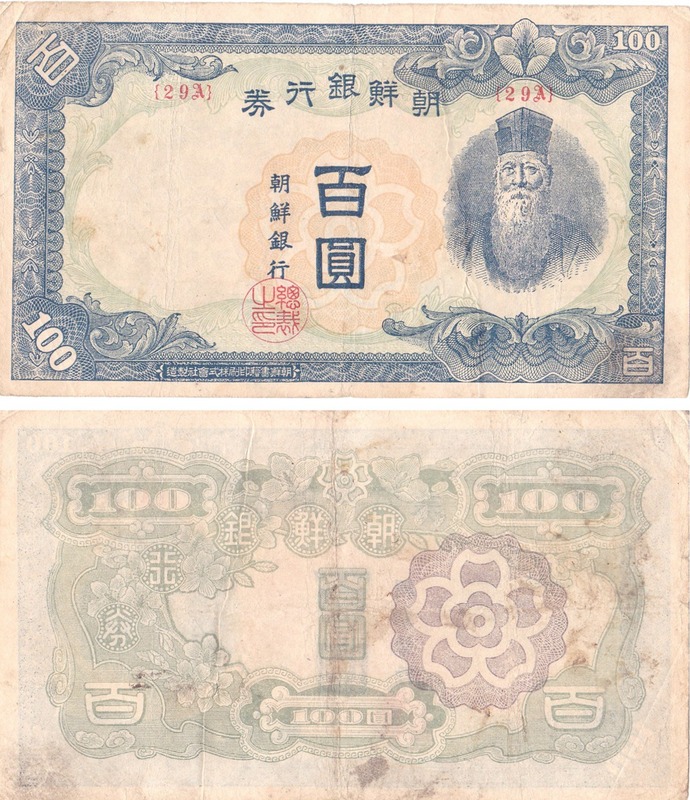 L1030, Bank of Korea (Chosen), 100 Won (Yen), 1944 Issue P-37. VF condition, please refer the picture. Issued in 1944 by Japanese occupied government in Korea. Krause Catalogue: P-37. 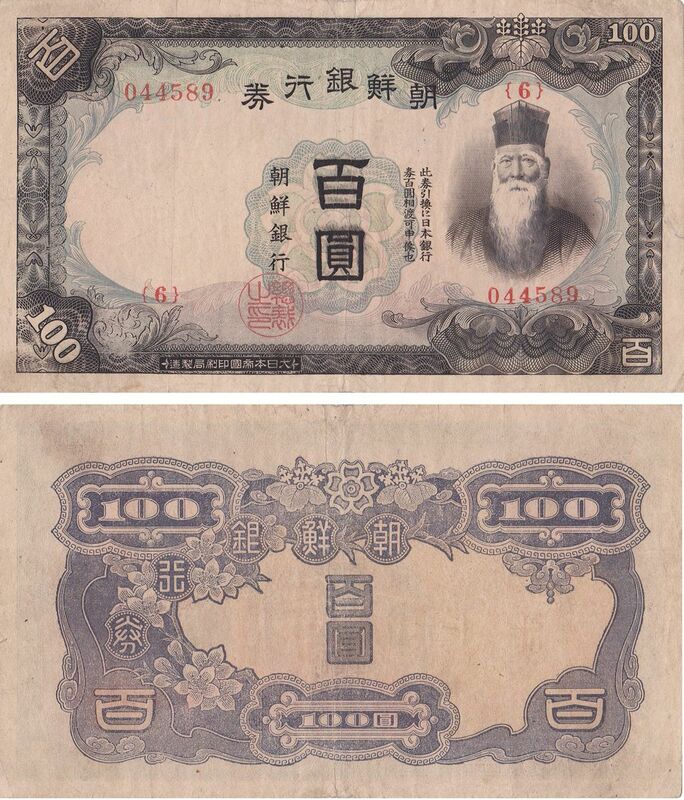 L1040, Bank of Korea (Chosen), 100 Won (Yen), 1947 Issue P-46. VF condition, please refer the picture. 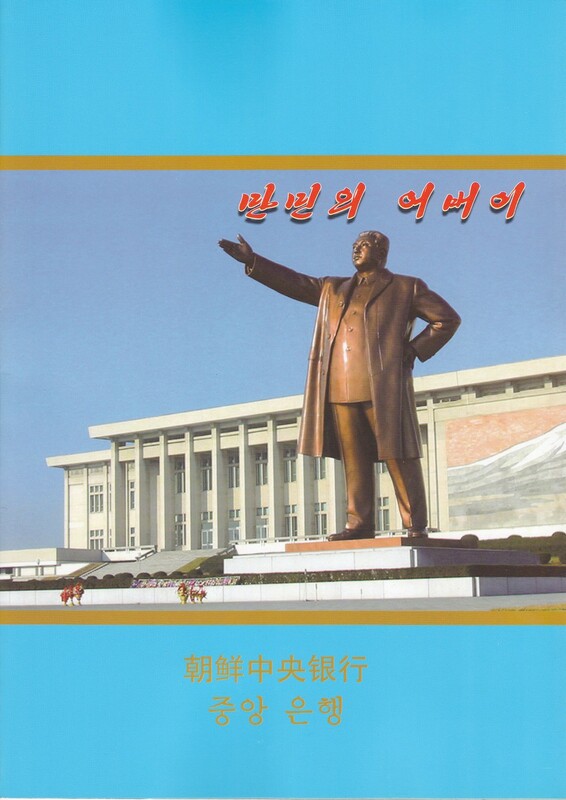 Issued in 1946 by USA supported government in South Korea. Printed by Korean local printer, with poor quality. Krause Catalogue: P-46. 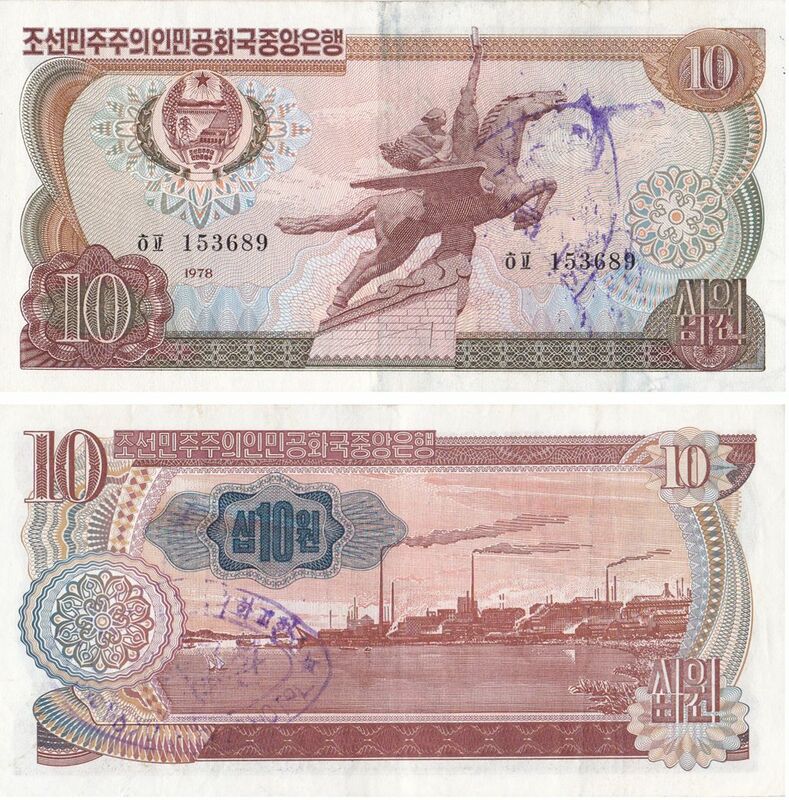 L1055, Korea 1959 Banknote 2 pcs, 1 Won and 5 Won Paper Money, AU. AU, please refer the picture. 1 Won: P-12. 5 Won: P-13. 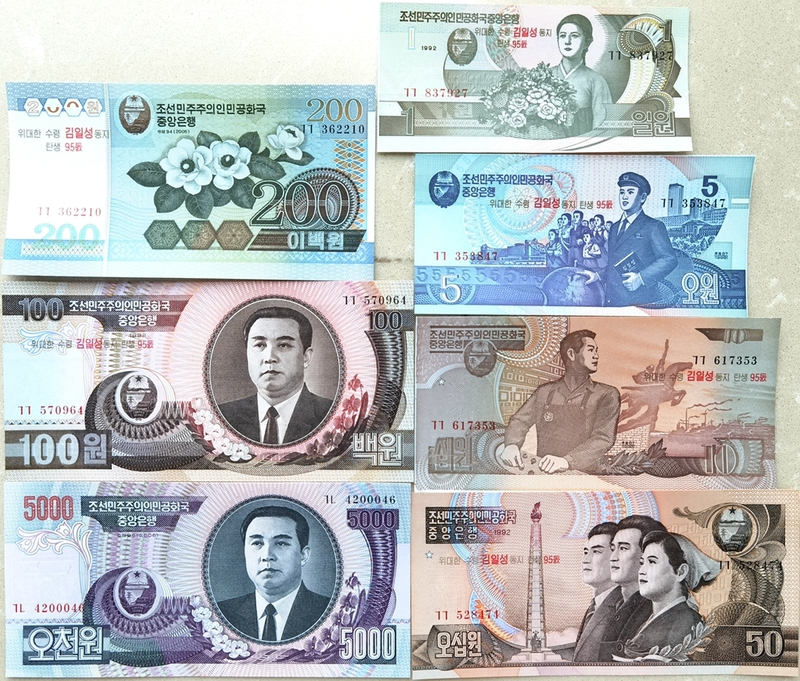 L1056, Korea 1978 Issue of 5 Pcs Banknotes, Paper Money P-18 to P-22. UNC, 5 pieces in all of 1978 issue. This item has 1 Won(P-18), 5 Won(P-19), 10 Won(P-20), 50 Won(P-21) and 100 Won(P-22). 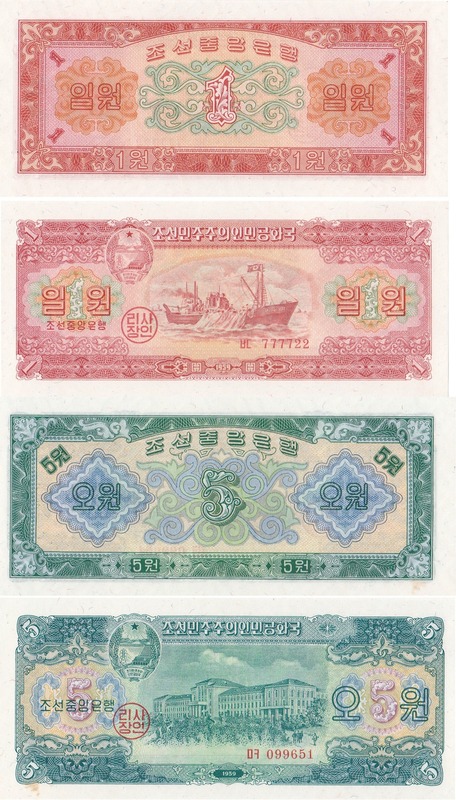 L1061, Korea 5 Won Banknotes 5 pcs Varieties, 1978, P-19a to P-19e. 5 Pcs AU to UNC. Uncirculated. 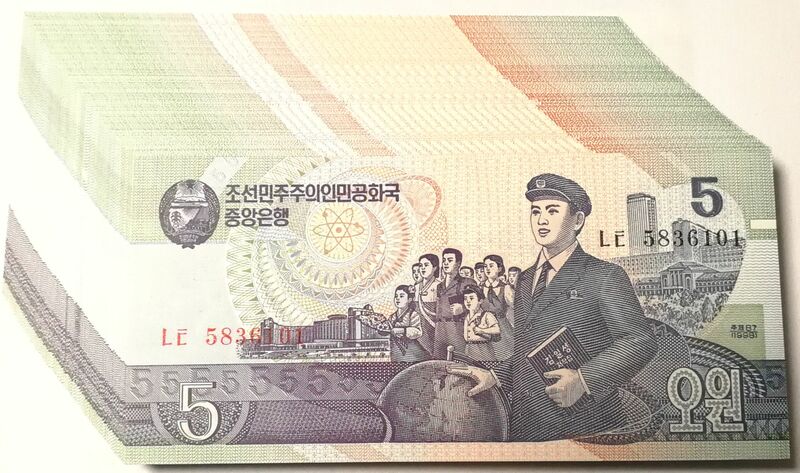 Issued in 1978 by Korea, 5 Won. Full set of 5 pcs, different overprint. That is P-19a, P-19b, P-19c, P-19d, P-19e. 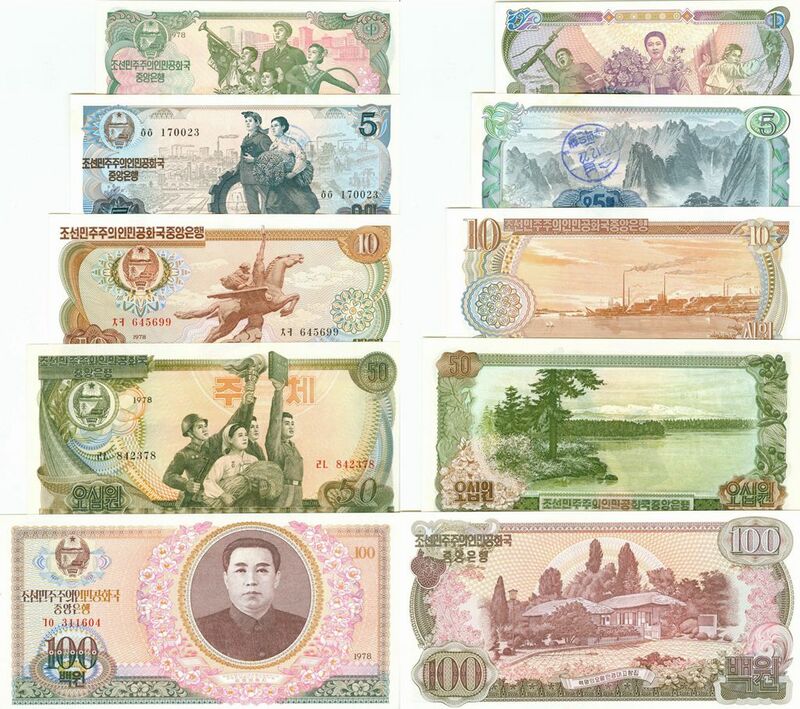 L1062, Korea 10 Won Banknotes 5 pcs Varieties, 1978, P-20a to P-20e. 5 Pcs AU to UNC. Uncirculated. 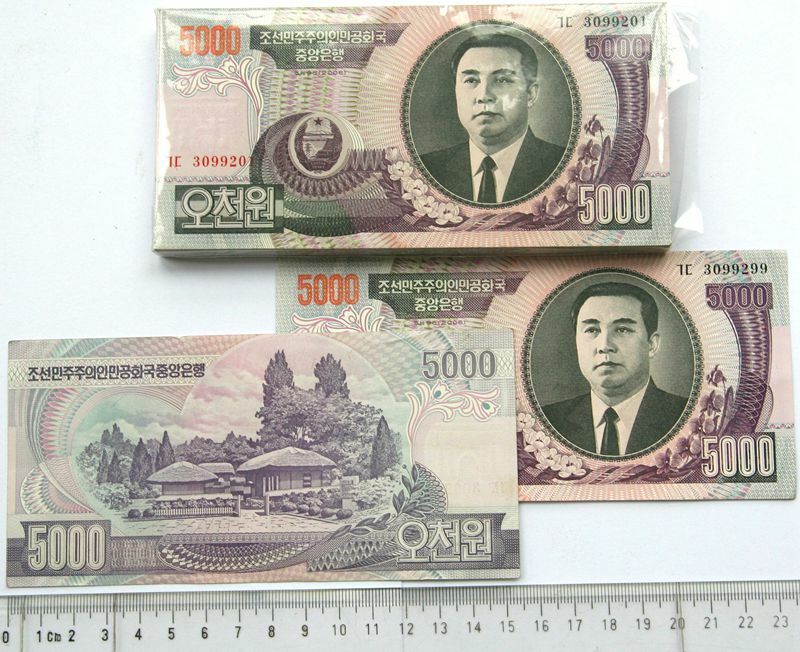 Issued in 1978 by Korea, 10 Won. Full set of 5 pcs, different overprint. That is P-20a, P-20b, P-20c, P-20d, P-20e. L1063, Korea 10 Won Banknote 1978 Foreign Exchange Note, Overprinted "Hotel"
L1064, Korea 50 Won Banknote 1978 Foreign Exchange Note, Overprinted Cashed. On Fine condition, circulated. 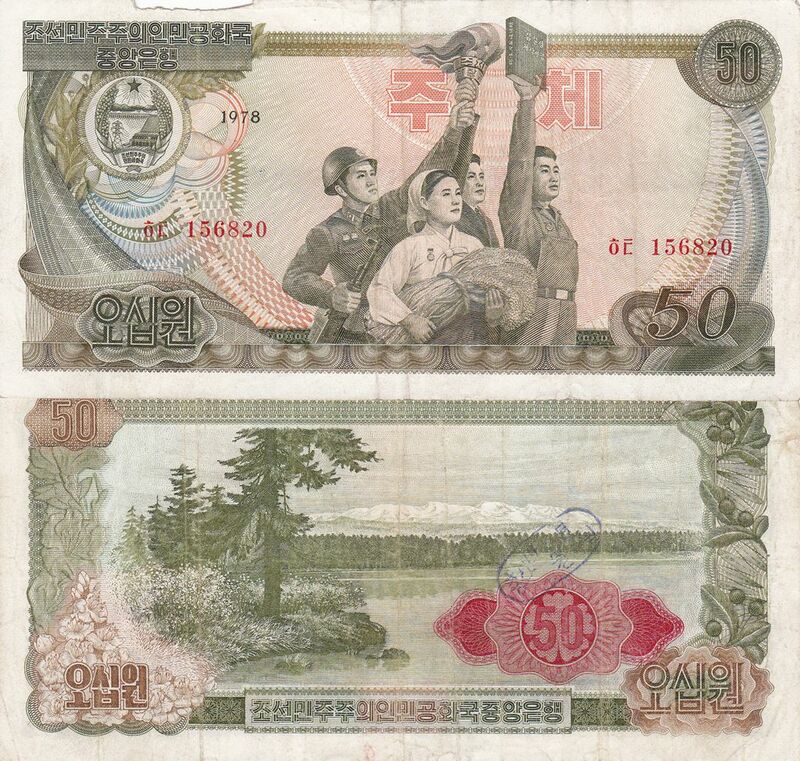 Issued in 1978 by Korea, 50 Won. 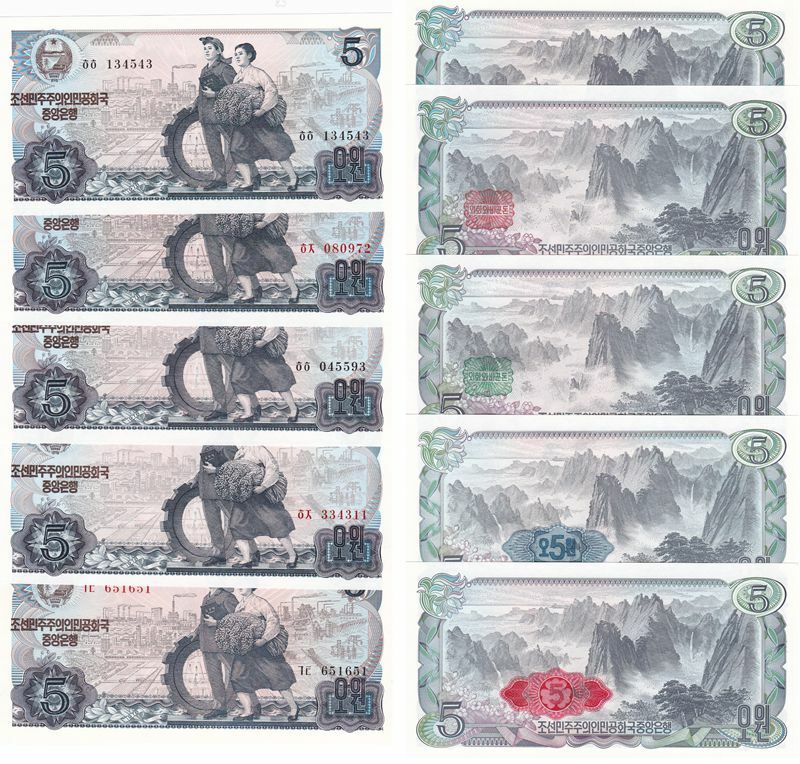 This kind of banknote was used for foreign only. And with a seal of "cashed". 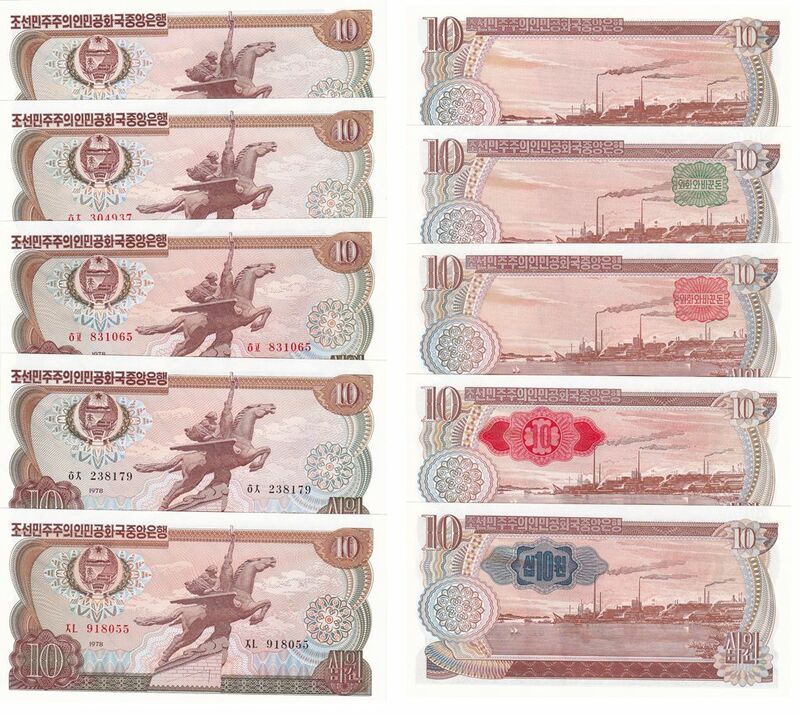 L1075, Bundle of 100 Pcs Paper Money, Korea 5 Won Banknotes, 1998 (P-40). UNC, 100 pieces in original bundle. Kruase Catalogue No. P-40. 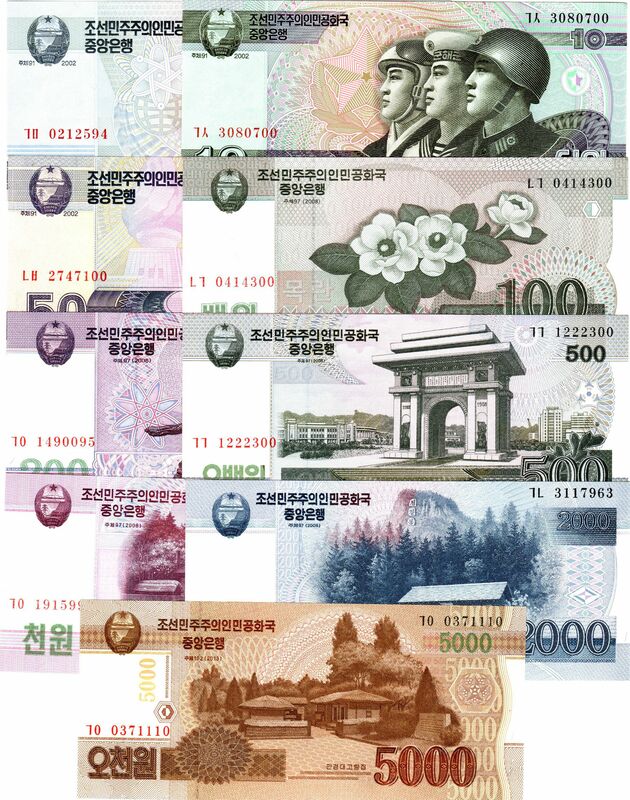 L1085, 100 Pcs Korea 100 Won Banknotes, 1992 (P-43). UNC, 100 pieces in original bundle. Kruase Catalogue No. P-43. 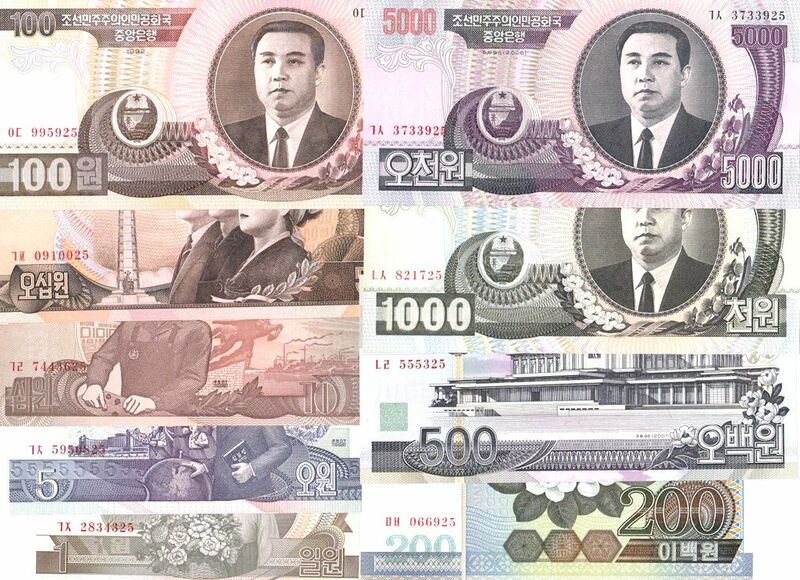 L1094, Bundle Korea 5,000 Won Banknotes, 100 Pcs, 2006. UNC, 100 pieces in original bundle. The 2006 Issue. 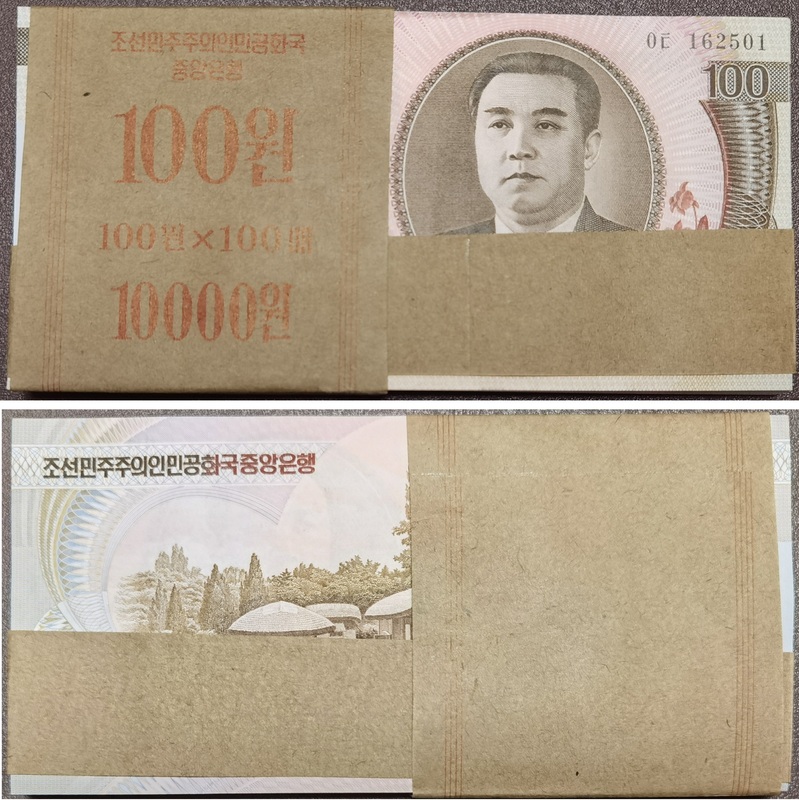 L1098, Korea 5000 Won Uncut Banknotes, 3 Pcs 2006. Please see the picture. UNC condition. 3 pcs uncut banknotes, with booklet. Issued in 2006. Kruase Catalogue No. P-46.